General purpose hand held mini round knife cloth cutting machine with 50mm (approx 2") blade and carbide counter blade for scissor like precision cutting. Fitted with a 6 sided circular blade which works in conjunction with the counter blade to give a clean cut in many types of cloth. A simple to use sharpening grindstone allows you to get the most out of each blade. 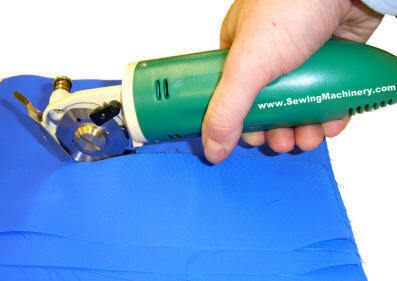 Designed to cut single pieces or a few plies of cloth while reducing the effort and repetitive strain associated with hand shears & scissors etc. Replacement blades and stones available.